In November 2013, City Council requested that the City Planning Division undertake a study of Broadview Avenue, between Danforth Avenue and Bater Avenue. The Toronto City Council direction authorizing this study is available at TE27.67 – Planning Study for the Portion of Broadview Identified as an “Avenue”. 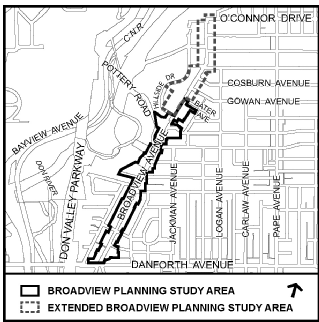 In June 2016, City Council amended the Official Plan and adopted Urban Design Guidelines for the lands fronting on Broadview Avenue between Danforth Avenue and O’Connor Drive. Properties with frontage on Broadview between Danforth Avenue and Hillside Avenue on the west and Danforth Avenue to Bater Avenue on the east side of Broadview.